AND YOU CAN ACHIEVE WHATEVER YOU SET YOUR MIND TO BECAUSE YOU'RE AWESOME!! Today, I 'm thrilled to have my friend and fellow Crimson Romance author, Lynn Crandall visiting. Lynn is here to tell us about her new paranormal release, Heartfelt. I asked Lynn to tell us a little more about Heartfelt than we can read from the blurb. Well, she has gone above and beyond my request by asking her hero, Conrad Pike and her heroine, Asia Blue to join her for a little sit down. I'm going to get out of the way and turn this blog space over to Lynn. I hope everyone enjoys meeting these amazing characters that will touch your heart. Thanks Nancy. Were-lynxes Asia Blue and Conrad Pike have been BFFs for years. BFFs without benefits. But things are changing. Asia’s telepathy with animals is now expanding to enable her to read the minds of humans. 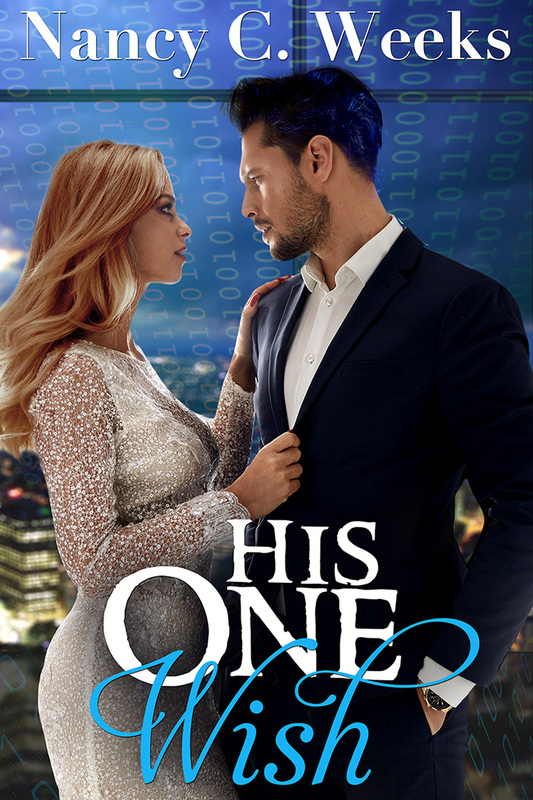 It’s all very confusing for Asia to learn to manage her new ability, especially since she’s trying to develop a romantic relationship with a human, Gavin Strong. Conrad Pike is right there to help her learn to adapt with thoughts of humans invading her mind. He believes the change that is driving Asia crazy is something she brought on by opening herself to a human. But he’s changing, too. He’s never wanted a romantic relationship with his best friend because they’ve agreed it could jeopardize their friendship. Plus their differing beliefs about humans stand between them: Asia respects them; Conrad believes they are irrational and dangerous as a species. But stirrings inside him, whenever Asia was around, are prompting questions about their relationship. Let’s listen in on a brief character interview. Me: Asia, how long have you and Conrad been good friends? Asia: (smiles and looks at Conrad) About eight years. We met back when Mr. Bad Boy here was not yet 21 and I was 18. He was sweeping floors at a soup kitchen, serving community service instead of going to jail. Me: Conrad, jail? What was that about? Conrad: (Glares at Asia) Underage drinking. Thanks, Asia, for mentioning that. Me: So what brought you together were your similar secret identities? The fact that you were both were-lynxes? Conrad: That. Plus, we both had issues and found solace in each other. It just happened, and we’ve been friends ever since. Conrad: (Runs his fingers through his blond hair) Right. Besides, Asia is interested in a quote, normal relationship with a human male, not with a were-cat. Me: Is that so, Asia? Asia: (Narrows her eyes) Yes. I’m weary of all the drama and danger our were-lynx colony seems to run into all the time. I want normal. I’ve never had normal, not with my mom’s alcohol abuse. I mean, I’ve always had to take care of things: make sure food was in the house, the bills were paid, stuff like that. Conrad: And now she has to learn how to manage her expanding ability to read minds. It’s not easy for her to have a relationship with a man. Humans’ thoughts are more invasive and complex than animals. Me: Interesting. Tell me about that, Asia. Asia: Animals are very straightforward. If they’re hungry, they find food. Humans get hungry and they think about what food sounds good to them, can they afford to eat out or should they make dinner at home? Can they eat something high in calories or should they stick to carbs? I’m learning to filter out all the many, many thoughts floating around me. Since it’s a new thing for me, my brain is frequently overwhelmed, painful. But why are we talking so much about me? 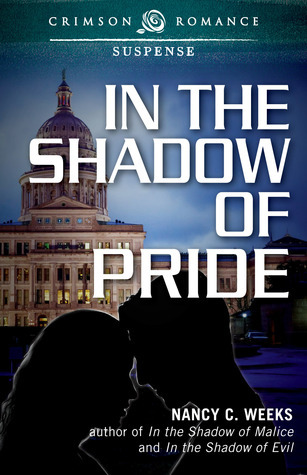 Conrad’s life hasn’t been a cakewalk, even though he comes from a very wealthy family. People don’t understand the pressures of wealth and status on children of wealthy parents. (She drops her gaze.) He almost committed suicide years ago. Conrad: Things are better now. Thanks in large part to my best friend. Conrad: Very mush so. She’s beautiful in body and spirit, and she saved my life. I’ll always be grateful. Me: You two appear to share something deep and meaningful. Are you sure there’s no romance in your future with each other? A burst of gunfire split the air. “I don’t know. How are you doing?” He glanced down at her, concern knitting his brow. Her heart jumped into her throat. “What? No. We stick together.” She couldn’t catch her breath. He was going to sacrifice himself for her and her mother? No. Everything seemed close up in that instant. Life and death, love and friendship. She quickly bent to the ground and laid her mother on a soft patch of grass. “What are you doing?” Conrad’s face contorted into confusion. She dropped her arms and turned halfway to her mother. Conrad grabbed her and pulled her close. Their eyes held for a whisper. He pressed a solid, passionate kiss to her lips. He brushed a lock of her hair back from her face. Then he headed away from her, sprinting just off to the left of the voices, thrashing loudly through the trees and pounding a thick branch against the brush. As always, if you have any questions for Lynn, please leave a note in the comment section below. We both love hearing from readers so feel free to ask us anything. I hope you had a restful weekend. Today, I'm releasing my new look on my Website, Facebook Author Page and Twitter. There are still a few quirks I want to improve, but I'm hoping this new look makes this space easier to read and navigate. I will continue to share my exciting new writing adventure with you, express my ideas and thought on occasion and introduce you to the fascinating people I meet [real and fictional] in my travels. If you would like to stay in touch with me, I post regularly on my other social media sites as well as this space. Please check them out when you have a minute to spare. I hope you enjoy the new look. Let me know what you think by leaving a note in the comment section. If you can't get it to work, you can always leave a comment on my Facebook Author Page or Twitter. I will respond to your comments because I love hearing from my readers. That's it for today. Have a great week, and as always, be kind to one another. Today I'm being interviewed at The Write Way Cafe. I'm talking about my writing life, inspirations and chocolate cake. Here is a little taste. If In the Shadow of Vengeance was made into a movie, who would play your main characters, and why? What a wonderful thought! As I was writing Vengeance, I envisioned Elizabeth Merlot as a combination between Julie Gonzalo and Stana Katic. They portray such strong, spirited women. For my villain, I have a little confession. I use to be an avid General Hospital fan and my favorite character was Sonny Corinthos. When I started writing my first novel, In the Shadow of Evil, I used the darkest side of Sonny for my inspiration for Elías Mendoza. So Maurice Benard would be my choice. He knows how to be charming one minute, and on a dime, completely ruthless. As for Noah McNeil, I’ve haven’t found an actor that I can say, “He’s a perfect Noah.” Maybe your readers can give me some suggestions. I have had some amazing people who have supported me in my writing journey. First on the list has to be my mom. She used to constantly ask when was I going to write my book. She saw something in me that I didn’t see in myself. Sadly, she passed away before I had the courage to take that first step. As for that first step, my wonderful sister, Mary gave me that shove. When she decided to quit smoking, I told her I was her sponsor of sorts and would do anything to support her. She challenged me to send her the first ten pages of my first chapter. I started In the Shadow of Evil and she loved it. After a year, I had a finished novel and she was smoke free for 365 days. Awesome moment for both of us. Here is the link for the rest of the interview: The Write Way Cafe. Drop on my and make sure you say hi! 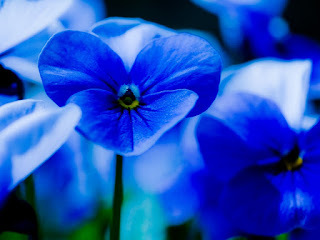 I have invited back to my blog my dear friends, Cary Morgan Frates and Deborah O'Neill Cordes, who write as Morgan O'Neill. They have dropped in to share a few more tidbits about the hero of The Thornless Rose, an Elizabethan Time Travel Novel, Jonathan Brandon. 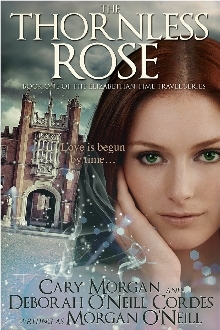 The Thornless Rose will be ONLY 99 cents ~ August 3-16 from Entangled/Macmillan. Deborah and Cary, my blog space is all yours. I can't wait to be hear more about this intriguing hero. "I loved this hero, Brandon. He was down to earth, simple, yet strong when needed, and I found that so appealing. "—Amazon reviewer Book Addict. We got such a great response with readers wanting to know more, we decided another peek behind the curtain is in order. 3. Begun by Time, our prequel to The Thornless Rose, tells the story of Jonathan and his fiancée Catherine Hastings before he vanishes into the past. It also lets the reader know what happens to Catherine afterward, including how she meets Arthur Howard. During WWII, when Jonathan is a RAF flight surgeon at a base in southern England, Arthur accompanies King George VI as he visits with the wounded soldiers there. Completely unaware, Jonathan and Arthur are in the same room for several minutes as the king greets the troops. Little do they know they will both play pivotal roles in Catherine's life. We are planning to work this scene into our sequel Ever Crave the Rose. In the meantime, readers can learn more about Jonathan, Catherine, Arthur, and our other characters in our Elizabethan time travel series, The Thornless Rose and Begun by Time. Thanks Nancy for hosting us on your blog. Happy reading to one and all! Where to find their books! 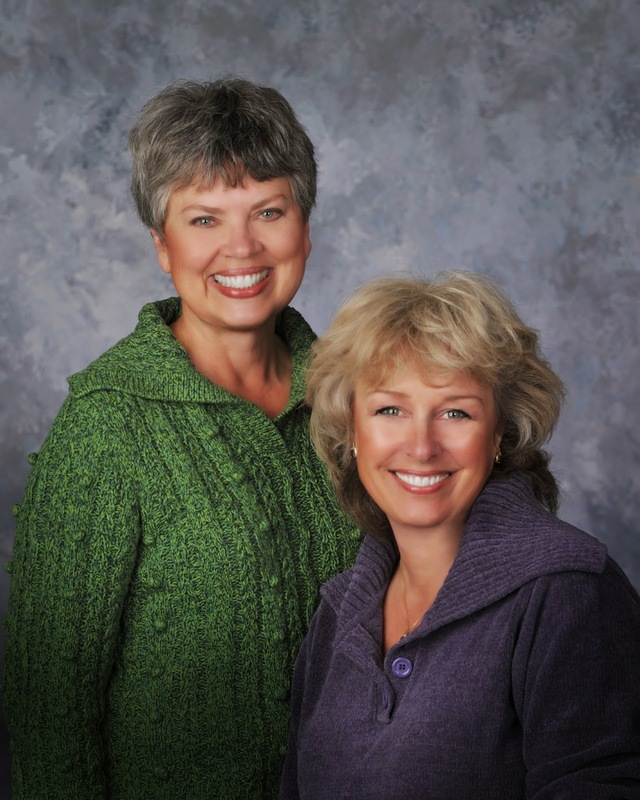 If you would like to keep in touch with Deborah and Cary, here is where you can find them. As always, if you have any questions for my guest authors or myself, please don't be shy. Ask us anything! I hope you have a great weekend. Until I see you again, please be kind to one another. Great news! 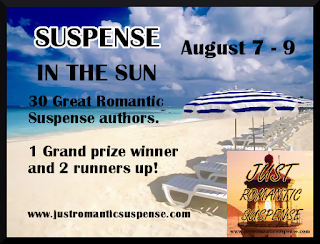 My novel, In the Shadow of Pride will be part of SUSPENSE IN THE SUN Contest August 7 - 9 with JUST ROMANCE SUSPENSE! It's super easy to enter. 30 wonderful authors gifting 30 fabulous books. Mark your calendar! 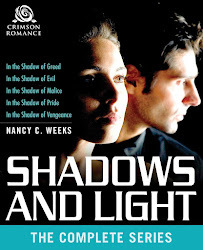 If you haven't picked up your copy my 5 book series all together in on bundle called Shadows and Light: The Complete Series, do so today before it is gone forever. Here is what one Amazon customer said about the bundle. "All five of these books are excellently written with relatable characters and truly despicable villains. Just one is worth the asking price - it's like getting the other four for free!!!!!" At $2.18 for the entire bundle, I have to agree it's a real steal. Just click on the cover in the right sidebar and it will take you directly to Amazon. That's it for today. Enjoy your last few weeks of summer, and as always, be kind to one another!